Over at Creative Workshops Gail has added two new and exciting classes for your Muse! As always Creative Workshops wants to find ways to inspire your muse, to help you when you fall into a creative slump…and face it most of us do from time to time, and while it’s gotten to be a tired out adage, Creative Workshops offers ways for you to “think outside the box” when it comes to your artwork. This is not a class about creating anything digitally through Photoshop or any photo editor. It’s about what you can now print on that you couldn’t print on before, because inkjet ink won’t adhere to many surfaces without going dull or faint or blurry. And too often inks will pool, run and smear easily. But not anymore! The first class is one Gail Schmidt is offering and it is most definitely a class for those of you who want to take it up a notch! It’s titled Golden Digital Grounds – Expand Your Possibilities!Class starts May 11, 2009. 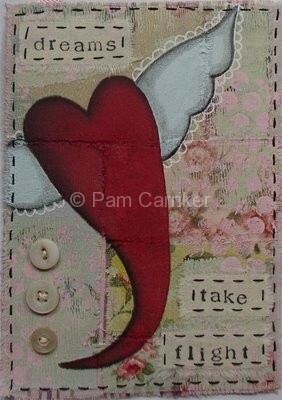 The second class is being offered by Nancy Lefko and is titled PAINTED FABRIC COLLAGE WORKSHOP . Nancy is mixing it up with patchwork, paint and collage…all on fabric. Now your Muse will have another take on working on fabric that maybe she hadn’t thought of before. Nancy has been receiving great feedback on her Mixed Media Backgrounds class so I know that this class will be just as fun and informative! Class begins May 25, 2009. And as I already mentioned in a previous post, I am offering a second session of Visual Journalism 101 and Shades of Grey Moleskine Journaling is also open for registration. Come check us out! 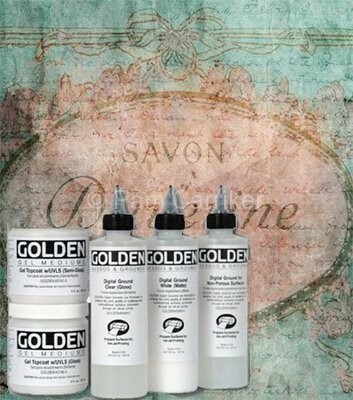 Ohhhh I bought that set of Golden products at a trade show and haven’t tried it yet. Both of the featured workshops look like such fun! Your art work is very heart warming, so to speak. Thank you for sharing.